Interesting pic from the movie the other Boleyn girl. Set in the period of Henry VIII of England the story revolves around the sister of the more famous wife of the afore mentioned King. 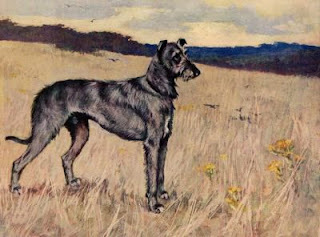 Again, the movies use of deerhounds is a form of period scene setting, but evidence we have found for the period, indicates that the Scottish deerhound would appear somewhat alien in the 14th Century English countryside of the day. Still, it’s good to have true natural beauty appear amongst a crowd of human kind in fancy dress. Stunt Dogs were used to provide placement and supply the hounds for the silver screen, so if you feel your hound acting ability measures up, contact them through the link. Oh . . . and we’ll have the movie excerpt available for viewing soon. 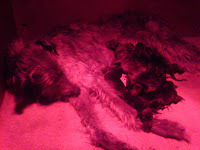 A friend from Canada sent some pics on the 12th of April of a friend in Norways’ eight little Deerhound puppies, 6 boys 2 girls and their mum! 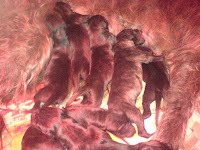 The friend has Baylind Kennel and co owns this with a partner from Croatia. 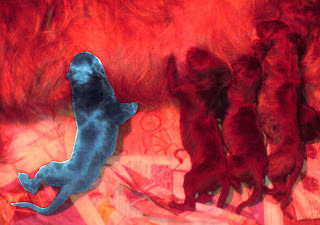 I decided to post this pic because of the strange markings on one of the little pups coat. 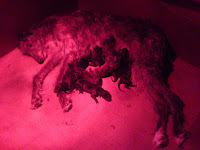 Yes this makes it easy to distinguish it as a Scottish Deerhound with the little genuine saltire markings. And how convenient that we post this with this comming Fridays‘ Scotland soccer match against Czech Republic in Prague. The Tartan Army will be there ! Let’s hope Croatia do well in the Euro’s and the forth-coming World cup 2010 and as for Norway - well, maybe not so well - especially when they come to Hampden on the 11th of October this year for the first of their World Cup Qualifiers. Perhaps we should meet up with ‘Baylind’. And for deerhounds everywhere . . .
We’ll be Comin’ doon the road . . . and you’ll hear the noise of the Tartan Army boyz as we’re comin’ doon the road! The big Sunday is here and as I lie around after a power of hard mountain and trail running in an attempt to bring my human Marathon team up to Deerhound fitness - they pound the Streets of Edinburgh at the Edinburgh Marathon. As part of the Hairy Haggis - ‘Running Cats and Dogs’ team. Yes you may know these ‘commandos’ are in training for serious Highland games and Mountain Running so a Marathon will be a walk in the park for them (hmm? a dogs favourite). But our team run for a reason. They run in aid of the Scottish Society for the Prevention of Cruelty to Animals (SSPCA), for yes, there are still sad individuals on this earth who would bring harm to we animals. The target is set for fund raising, so if you wish to sponsor the team click on this link. And don’t worry if Sunday morning has come and gone in your time zone, or by the time you have read this, for we are still open to sponsorship until August 2008. Read on for the . . .
L.G. Langwill, Secretary and Treasurer of the Society. Scottish SPCA Report. Centenary Year 1939. Collaborating in 1850 with the RSPCA, which served and continues to serve England and Wales only, the Scottish SPCA helped secure legislation protecting animals. Penalties were imposed for ill treatment and over-driving and the use of any place for fighting or baiting any bull, bear, dog, or other domestic or wild animal was prohibited. The legislation relating to Scotland gave the Society's Inspectors the powers of Police Constables in their localities, a status denied their English colleagues. This was maintained in the Protection of Animals (Scotland) 1912 Act and remained the case until local government reorganisation in the 1970s. The Scottish SPCA is now in the unique position of being a reporting agency to the Procurator Fiscal. Scottish SPCA committees evolved in the 19th and early 20th centuries, spreading the animal welfare message across the country. In 1875, the Society's Inspector and five Constables conducted 292 investigations. By 1903, the workload exceeded 3500. The turn of the century saw the Society purchase its first ambulance, built to order by John Beggs and Sons of Philadelphia, at a cost of £113. The Protection of Animals (Scotland) Act 1912 was the principle statute relating to animal welfare until 2006, when the Animal Health and Welfare (Scotland) Act was passed. The Scottish SPCA was very proud to play a major role in helping to campaign for and shape the legislation. Today, the Scottish SPCAs Board Members, Inspectorate, staff and supporters are as determined as their forbarers to see the day when animal cruelty stops. When knights were bold - we could be found gracing the hearth in the homes of such knights. So if you feel brave of heart and prepared to do combat to protect thine honour, come along this weekend for a joust at Traquair Medieval Fayre - but ye cowards be warned the children running amok amongst the knights, archers, falcons and knaves are much to be feared, bring yours. Hee! Hee! On with the hunt . . . I suggest I provide the stag for the roast. Eeps! Medieval Days indeed. Enjoy! This book by Author William MacKellar produced in 1964 is a joy. A Dog Like No Other. A gentle tale of a young lad who finds a bedraggled large hound, a Deerhound. The moving adventure begins. And woven into the childrens story are everything from sheep trials, highland gatherings, piping contests, the hidden sword of Bonnie Prince Charlie and a gruff laird (a bit like the boss when he’s no’ oot with the regiment). Lochs and mountains, ruined castles, shinty, highland bus journeys, a sense of fairness and good are all here, creating a picture of 1960’s Scottish highland life. Or so my human companions have told me. I’m much to young to have experienced it, even in dog years. If you wish a copy of this book and wouldn’t know where to start the hunt, the little ebay trader Gail and Zoo is a good place to start. These Scottish Deerhound images were rendered by Edwin Megargee (American, 1883 -1958) one of my favourite dog artists. 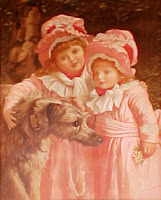 Megargee produced many works of art, more often referred to as illustrations, depicting dog breeds of every type, usually in pose pertinent to their purpose. To read more of the artist, view some of the art or purchase prints - follow the links. 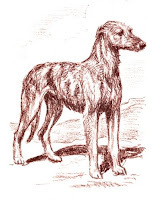 Also of interest from the Gallery featured in the first link is the Scottish Deerhound history page and links to original works of art available from the said site. 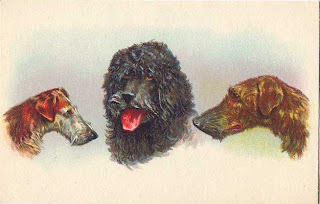 There are plenty enough dog prints of canine variety to keep an Art hound happy for hours . . . Enjoy! From this weekends’ Scottish Kennel Club CC comes the Deerhound class. And if you want to enjoy a sing-a-long to one of the featured songs, Rabbie Burns’ Bonnie Mary the lyrics are included below. This version is by Martin Treacher from the Burn it Up! cd. And with all the magic that these internet pages can include - the pipe tune on the video comes from our friends Saor Patrol and is featured on their new album Full Throttle. The track is entitled Aftermath (Blar-nan-leine, 1544) Battle Of The Field Of Shirts and for the history of this event (because everyday is a schoolday . . .) or to obtain information / Saor Patrol music, as usual follow the relevant internet magic link. It's leaving thee, my bonnie Mary! Here’s a wee postcard on the day that Mary Queen of Scots married James Hepburn, Earl of Bothwell. Oh and with all the Scottish Independence ‘national conversation’ and ‘devolution’ debates occupying the Scottish news, it’s worth mentioning Austria established itself as an Independent state on this day in 1955. No such complications for us hounds, I just lift my leg and that’s the territory marked! 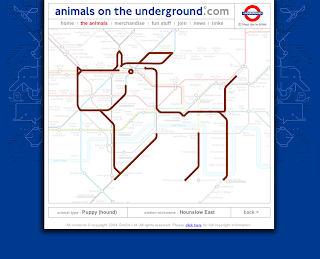 Hounds on the London Underground ? Just because we had to . . . click here ! Dogs love you. End of story. 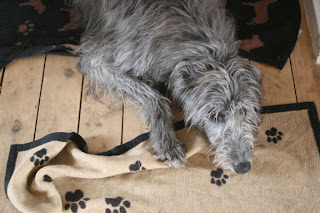 Although this is not strictly deerhound - I had to include it here. As a deerhound, I can relate to other Scottish hounds and their adventures even in fiction. So as this book was read, which features a tale about Manny Riley and his epileptic lurcher Bailey, we found ourselves falling about laughing out loud. 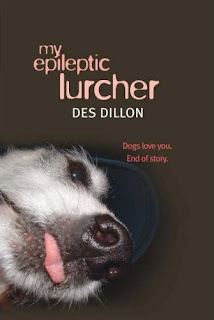 For an insight into Mannys’ life and a reflection on aspects of the small Scottish village life that most people in Scotland experience at sometime or another, read my epileptic lurcher by Des Dillon. The ‘Neds’ in the park sequence is a howler. Essential! and remember Dogs love you. End of story. This image I like. Interestingly, it comes from the London Illustrated News during the Victorian Era. A period, when, due to Queen Victoria’s withdrawl from London to her purchased estate of Balmoral, a romantic interest in Scotland was nourished throughout the British Empire. 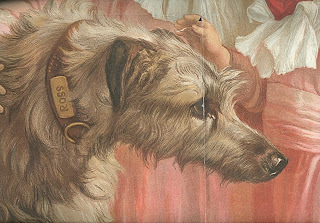 This period is one of the Deerhound history highpoints. Whilst at Balmoral, the Queens association with we deerhounds was common place and indeed some of the worlds first photographs were of these hunting hounds. Having copies of these images, we may even seek Royal permission to reproduce them here soon. I’ll have a word at the Braemar Gathering where Liz and the Bairns will nae doubt be in attendance. The Rogue will lounge about as Ricky Tosses the Caber and runs up the mountain side. In the meantime - enjoy this little piece of art and detail from a London perspective of what we hounds are all about. From the many volumes of Rogues Tales of the Scottish Highlands, we bring you another interesting little ‘oldworld’ tale. This copy was originally published in the 1937, Lure of the Kelpie book by Helen Drever. 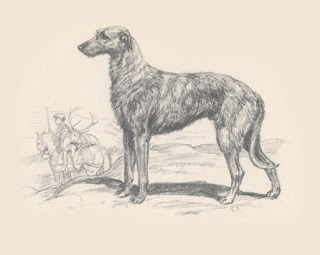 The original story would possibly have referred to the highland grey hound - ’ahemm‘, later to become the popularised, greyhound when translated from Gaelic to the English. Still, lovers of Shrek might find some interesting cross referrals (is it any wonder he had a Scots accent) - and all the while, you may have thought Princess Fiona was a Walt Disney creation and sleeping in the swamp a Dreamworks moment. There was once a King in the Highlands who had a quarrel with a wizard. Now wizards are uncanny people to quarrel with, and if the Queen been alive she would no doubt have persuaded the King to " let sleeping dogs lie," as they say. Instead of which the King called the wizard a scoundrel and declared that he would be revenged on him. How it happened we do not know---whether the wizard killed the King or whether he only willed his death---but the King died very suddenly, leaving his son Fergus and his daughter Fiona alone. They had a big old castle, but not much money---for the King was poor, as kings go; and they had few friends, and no servants---so they felt very desolate indeed. The wizard came to see them, and he said pityingly: "Poor young things! Although your father, the King, quarrelled with me, I should like to be your friend," and Fiona was grateful for his kindness. But Fergus distrusted the wizard, and felt sure that he only wanted to get possession of the golden sceptre and the inlaid sword that were the dead King's greatest treasures. So he stole out in the night, carrying the sword and the sceptre. He made for Beinn Ghloine, the nearest mountain, which was a very difficult hill to climb, because at all times of the year it had a glassy surface like ice. But Fergus knew it well, and he soon reached the cairn on the top. He pulled the cairn down, stone by stone, placed the sceptre and the sword at its base, and rebuilt it. And then, tired out with all his exertion, he lay down and fell asleep. "What can that lad be doing at this time of night? I must go after him and find out." He traced Fergus by his footprints on the dewy grass right to the foot of Beinn Ghloine, which he proceeded to climb. He took a very long time to reach the mountaintop, but when he got up, there was Fergus, lying sound asleep, and at his mercy. "Aha! I have you now! " he snarled, and he began to chant a horrid spell, as he made some waving motions over the sleeping boy. And poor Fergus woke to find that the wizard had turned him into a greyhound, and in that form he had to retrace his way down the mountain-side. The wizard now turned his attention to Fiona, who was a very pretty girl with a skin like milk and roses. He did not change her form, but he changed her colour to grass green, and he roared with laughter when he saw the result. "Look you!" he said to the brother and sister. "Look at the bonny pair of you now! You will never become as you were, unless and until---and indeed it is not very likely to happen---you, Fergus, can find a beautiful girl who will of her own free will marry a greyhound! And until you, Fiona, have nursed three children of a King's son, and got a kiss from a King's lips. Until that happens, the bones of your father must lie unburied ! " Time went on, and the King of a far-away region of the Higklands set out with his followers to make war on a neighbouring King. They were marching among the hills when a great mist came down and veiled the mountains, so that they could not tell in what direction the were going at all. One wandered here to seek the road, and another wandered there; and although the King kept calling to them to keep together, they soon got separated. The first time he called, three hundred voices answered him. The second time, only thirty replied; then only three; and at last, none at all ! So there he was---a King without a single follower, and he not even knowing where his kingdom lay! He wandered up and down, and at last he came to the Castle where the greyhound and the green girl lived. They gave him food and a bed, and the tired King slept for many hours. Next day, when he was looking about the Castle grounds, he saw some bones lying in a corner and he began to kick them idly. To his surprise the greyhound sprang at him angrily, and, finding his tongue, he said to the King: "Touch not the bones of my father!" "But why do you not bury your father's bones?" asked the astonished King. "Alas! there is a spell upon me," said the greyhound, "and I may not bury the bones until some girl will, of her own free will, marry me as I am. Look at me and tell me if that is likely to happen!" "Well," said the King, "I have three daughters who are all beautiful. When I go back to my kingdom I will try to convince one of them to come here and break the spell by marrying you. Shall I go and fetch one of them now?" "No, no!" said the greyhound. "We might never set eyes on you again! I'll tell you what---I shall keep you here as a hostage and send a message to your daughters to come and free you. My sister will put on her shoes that run by themselves where they are bidden, and she will soon bring them to you!" So the green girl put on the shoes that run by themselves and, covering her face with a veil, she set out for the far-away kingdom. And, in response to the King's urgent message, his three daughters returned with the green girl. When he told them why he had sent for them the two eldest were very indignant. "Really, father! You must be in your dotage to imagine that one of us would consent to marry a greyhound!" they said. "In any case, you have only his word that marriage would restore him to human form---and besides which he is nothing to us." But the youngest daughter, who loved her father dearly, said she would remain at the Castle as a hostage until the end of the year, when surely one of her sisters would be willing to take her place. 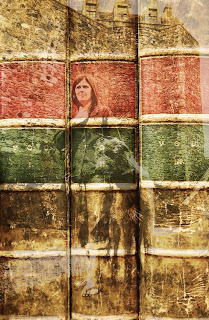 So she stayed on, and she and the green girl slept in the same room, guarded every night by the greyhound. When the King returned at the end of the year he was alone, and the youngest daughter said: "Why have you not brought one of my sisters to take my place?" "Because they both refused to accompany me," the King answered. And the youngest daughter said bravely: "Well, father, I might be worse off than I am. The green girl is certainly ugly, but she cannot help it; and she and the greyhound have both been very kind to me. So, my dear father, for your sake I will marry the greyhound and you can return to your kingdom." The green girl joyfully fetched a priest, and while the marriage ceremony was going on the youngest daughter stood with her eyes closed, that she might not see her strange bridegroom. And when she heard him say, " Look at me, my little wife," it was an effort for her to open them. But they opened very wide indeed, for there stood before her the handsomest young man she had ever seen! Her consent to marry him had restored his own shape to the greyhound, who was once more Fergus, the King's son, and the bride was now full of happiness. 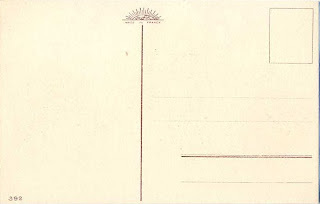 Fergus went and fetched two treasures to show to his father-in-law---the golden sceptre and the inlaid sword that he had buried unuer the cairn on Beinn Ghloine. And he was thankful that he could now bury his father's bones. When the King returned, well pleased, to his kingdom and told his elder daughters how happy their sister was, they were full of envy. One of them said spitefully:"Well, she may have got her Prince, but it will be very unpleasant to have to live with a grass-green sister-in-law! " But the King told them that the green girl was no longer in the Castle, for she' had gone to live at the foot of Beinn Ghloine. The two jealous sisters made a wicked plan---that, if a child should come to their sister, one of them would steal it away from her. And sure enough, when a babe was born to Fergus and his wife, the eldest sister came secretly to the Castle and stole to the room where the baby was. She opened the door stealthily, and was creeping up to the cradle in which it lay, when a green hand came in at the window and lifted out the child before she could reach it. So the eldest sister had to return home and confess that her plot had failed. The same thing happened in the case of two other babes, the green girl rescuing them from the envious sisters just in time; and with the rescue of the third babe half the spell that the wizard had put upon Fiona was broken, because now she had nursed three babes of a King's son. She gave back the children to the young couple, who were frantic with joy at their recovery, and when they heard the story the youngest sister said: "Our father must be told what my sisters have done," and she asked the green girl to carry a message to the King, asking him to return with her. So Fiona once more put on the shoes that run by themselves and went off to fetch the King. When they were nearing the Castle the King said to Fiona: "A heaviness has come over me. I must lie down and sleep for a while." And he lay down at the foot of Beinn Ghloine and went off to sleep. "Fiona, I have long watched for a chance to help you, and now it has come ! I am the fairy of the mist that hovers round Beinn Ghloine, and if you will climb the mountain I will give you a cup of wine distilled from mist, which is one of the things that the wizard has no csntrol over. Then, if you can get back to the King and make him drink the wine on his awaking, the wizard's spell may be broken. You must also get the King to give you a kiss before you can regain your old form, but that you can manage for yourself!" Fiona, of course, began to climb Beinn Ghloine at once, and though she often slid back she reached the top at last; and there, in the mist that hovers around the mountain-top, stood a cup of golden wine. She looked about for the fairy, but a voice said: "You need not look for me, Fiona. I am an invisible fairy, the spirit of the mist. So take the cup and return as fast as possible, for I think the King is about to waken." And the green girl, holding the cup with its precious contents very carefully, slid down the mountain-side and reached the King just as his eyelids began to flicker. "Oh dear! I am so thirsty!" he murmured. "If only you were not green, I should give you a kiss for that delicious wine. It has made me feel quite young again! "You could kiss me without looking at me," said poor Fiona, terrified that the fairy's plans would not succeed. "So I could and so I will," said the King, "for something in the wine told me to." Closing his eyes he drew Fiona to him and kissed her lips; and when he opened his eyes, expecting to see the green girl, what was his amazement to see instead a lovely blushing creature with a skin of milk and roses! "Where is the green girl ? " he asked, looking about him. "I am she," said the happy Fiona. " I am free now from the spell that the wizard cast over me, for I have nursed the three babes of a King's son, and I have received a kiss from a King's lips!" "Fiona," said the King wistfully, "if I were not too old for you, I should like to make you my Queen, for I love you!" "But, sire," said Fiona shyly, "you look every bit as young as my brother, Fergus." "Take your bride, O King, for I have lifted half your years from you that you may make Fiona happy. The wizard can never again harm her, for both of his spells have been broken. And from now onwards the fairy of the mist that hovers round Beinn Ghloine will make life golden for the girl with the skin of milk and roses that was known as The Green Girl."